The world has been lights-out for three months and society has fallen into chaos. Teenage gamer and tech-genius Simon Harper has been searching for the cause of the outage, but each new discovery only leads to more questions. When the key to restoring power finally falls into his hands, Simon will have to partner with one of his least favorite people, his twin brother West, to bring it back. On their 500-mile trek to Waypoint, they’re tested in ways they never expected. And when two girls with secrets of their own tag along, the brothers must decide if trusting them is worth their lives. Will Simon survive the journey if the first girl he's ever cared for happens to be the enemy he’s running from? Join Simon and West on an epic adventure as they evade enemies at every turn and discover if they have the strength to achieve the impossible. I love reading YA fiction, but typically I don’t lean toward action/adventure stories. I’m so glad I took a chance on Waypoint, though! The entire book was full of suspense and kept me wanting to read more to see what was next – I could never quite guess, though, because it was full of surprises. I loved the characters of Simon and West. After the first few chapters alternating between their stories, two other main characters are introduced, and the book shifts chapters between the four of them. I wasn’t expecting this, but it was interesting to get inside the minds of the girls. I would’ve really liked to dive into the characters of Simon and West more, though! Overall, this book is extremely well written, from the dialogue to the scene descriptions. The plot is unique, and the story is fast-paced. I also enjoyed the mix of romance in there. 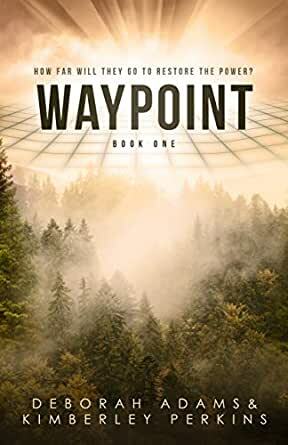 I definitely recommend Waypoint to anyone who enjoys YA action, adventure, or romance! Waypoint is filled with non-stop action spurred on by four multidimensional main characters from cover to cover. An unlikely group; there’s a politician’s daughter, a jock, a computer geek, and a federal agent all just trying to stay alive and safe until they can save the world. I highly recommend this book and cannot wait for the sequel. I was given this book for free to read review. What lengths would you go to relight the world and save humanity from tearing itself apart? That is what twins Simon and West are asked to decided in Waypoint. This book set in a not so distant future gives use the conundrum of if we can have one universal electrical grid should we do it, because the promise of a no fail system like the unsinkable Titanic is somehow always doomed to fail. This book is full of intrigue and espionage and some daring late teens that are in some ways stronger, smarter, more trustworthy, honorable, and all around just might be lucky enough to pull off what adults can't do. I really fell in love with these characters and cheered when they did well and worried when they were in danger. The twists and turns were froth with danger, but there was plenty of humor to lighten the heavy mood. I also liked the romance blossoming for the two brothers changing each into the adults they will become. I can't wait for book two. Good job ladies on your first foray into the world of novelized fiction. Everyone please read this book so they can keep writing. What a story! There's action, adventure, and romance with some crazy plot twists thrown in! Great book. Dual stories happen here with Simon and Riya then West and Alex before they unite again in DC. Both stories are interesting and move along the plot as they try to get to DC to turn the power back on across the country. There is a huge twist at the end that I did not see coming. This is part of a series so there is a big cliffhanger at the end. Wow! That sums up everything I want to say about Waypoint. As soon as I started reading this books, I could not put it down. It is action packed, with a thrilling plot, developed and complicated characters, and writing that delivers everything you’d want in a novel like this. The characters are very intriguing and well developed. I was passionately cheering for them the entire way through. I liked the bits of romance scattered around. It gave this book an even more realistic feel. There were also bits of humor to lighten the tension and I just loved that. I’m highly recommending this one to anyone who loves a bit of action, tension, romance, and really well-developed characters. I don’t think you’ll be disappointed.